I guess I'm a tree person. Some people love mountains, others waterfalls, and many fall into the category of wildlife lovers. Like frat boys, for instance. But I love trees. Especially those of the redwood variety, but also gnarled oaks, aspens and whatever you'd term this tree – above. It's located at Cape Meares Lighthouse & Wildlife Refuge in Oregon, just a short walk off the parking lot. 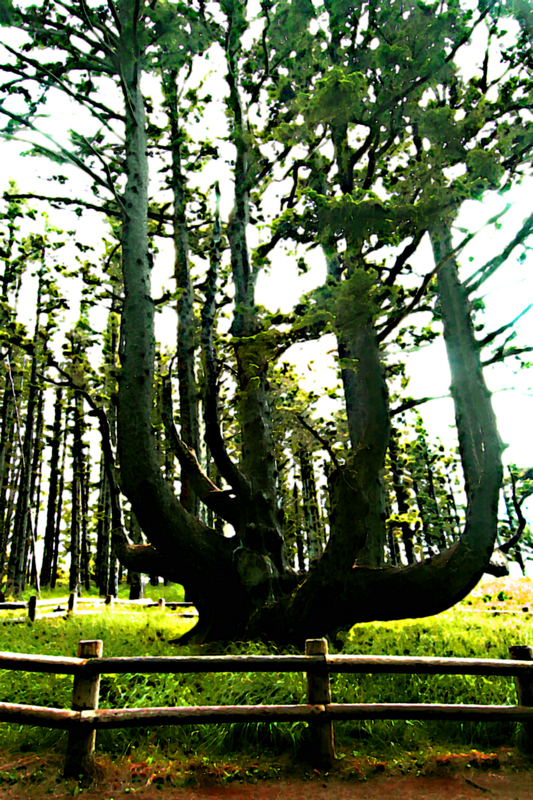 I had the family trek to see it on a whim, having no idea what an octopus tree actually was. Was it half tree/half octopus? Was it like the Whomping Willow in Harry Potter? It was a mystery, soon enough solved by a short walk. And now I do. So do you, and you're very welcome. Follow the link to Cape Meares and you'll learn even more. At no additional charge! Previous Post Maybe I’m amazed. Next Post Tiny bubbles, religious relics and the holiest of holy secrets.